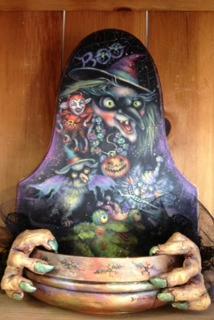 This Halloween Witch is surrounded by her best ghoul friends and offering candy treats in her bowl. Her hands are sculpted and decorated with fabric cuffs and a halloween ring on her finger! This is a very special offering by Bobbie T.